Yikes, I have to get back to blogging more regularly because trying to catch up on multiple days is killer. For instance, I was going through pictures on the "still" camera and found this video from two weeks ago. It's just a quick little vid and the quality isn't great but since I've been so stingy with the videos lately, I thought I'd go ahead and post this in arrears. This is me opening my October Book of the Month book. The BOTM is one of my favorite gifts because it keeps on giving... literally and figuratively (SWEET!) Unbeknownst (which blogspot tried to change to Unbeknown St even though Merriam-Webster confirms my spelling) to me, the BOTM books have been coming wrapped in gift wrap all this time but until this month, I had no idea. Where's the fable Dad! I guess I'm finally old enough to unwrap presents and drive and vote and well... maybe just that first one. Anyway, this is me unwrapping the BOTM...kind of. The book is called We're Going on a Bear Hunt but, um, I like bears and I certainly do NOT hunt. I did not LOVE this book but it's probably just because Mom & Dad did not put as much effort into their reading as the author did on YouTube. I would LOVE to see Dad act the book out like this. And I promise, if he ever does, it's going straight to YouTube as well. Oh, and while I'm playing catch up, here's a pic of Aunt Darty and me from when M&D went to see David Sedaris. Unfortunately it's a little blurry which is probably why it didn't make the cut last week. I foresee a new camera on M&D's Christmas list. I mean, I'm not gonna keep wasting my time smiling for them if all of their pictures turn out blurry. On Monday, I went over to Miss Anne's and did lots of playing with Logan and when I got home, I did lots of playing with Penny. Penny is very tolerant with me which I really appreciate because I just love grabbing her ears or collar or tags or pretty much any handful of fur I can get. Parker on the other hand comes in for a kiss and then settles herself just outside of my reach. Mental Note: New reason to work on crawling! Here are a few (blurry) pics of me playing with Penny. On Monday night, Mom & Dad went to see Ben Folds in Lawrence. Hey M&D, where's the fable with your busy social schedule, huh??? Anyway, I guess it was just BF and a piano on stage which makes me mad that I missed it because you know how much I LOVE the piano. But the good news for me was that I got to go visit Grandma and Grandpa Herbert and even got to do some playing with Aunt Abby and Uncle Scoot [sic]. We did some singing and piano playing of our own so eat your heart out BF! Today has been pretty chill. I've been doing lots of playing with Mom tonight. I think she'll probably sleep like a baby because I sure kept her busy! Of course, I've worn myself out in the process so I'm off to bed my self. On Thursday morning, Dad took advantage of the nice weather and dolled me up in the cute dress from above. And while he was getting things ready in the morning, I took the opportunity to play with my rings. Thursday was pretty average in general. The end of the night was pretty sweet though because I got to web-cam with Uncle Stearns an Aunt Robin. Also, it was (um, cousin?) Ernie's 1st birthday so I wished her a happy birthday too. Friday was one of Mom's off Fridays so I knew it was going to be totally awesome. I woke up around 7:30 and after breakfast Mom and I did lots of playing. We actually played a little TOO much because we were late for lunch with Grandma Herbert, Grandma Davenport, and Aunt Darty. We had lunch at the Cheesecake Factory and they have the most fantastic lights there! After lunch we sent Dad back to work and we headed over to the Holiday Mart. That place was a crazy mad house! I could have worn out the batteries of the camera taking pictures of all the nut jobs at that place. Fortunately I decided to hold off on the pictures to spare you readers. On Friday night, M&D and I went to Jack Stack for dinner but it wasn't our usual JS, it was the Freight Yard JS which means it must have been something special. Uncle Jeff and Tia Emily are in town so we met the two of them, their friends Kyle and Mary, Uncle Dave and AD and even Uncle Tim. Whoa, B-U-S-Y! It was a lot of fun but after only napping for about an hour all day, I had to get home early and go to bed. Today has been pretty chill. Just lots of playing with M&D and Parker and Penny. I have to go to bed now though because I have a busy day of playing with GmaD tomorrow. SWEET! Yesterday was pretty normal for the most at least until it wasn't. Shortly after Dad got off work, Mom got me dressed in a fun new outfit and the three of us headed out. We went to a place called the Jewish Community Center which was pretty awesome looking. As it turns out, today was the first day of swim lessons. Mom & Dad have been hyping these swim lessons for awhile now and true to form, Dad videoed the whole thing. Here are two minutes that are pretty representative of the whole experience. Sorry about the poor video quality, I'll see if I can fix it. As I mentioned, M&D have been talking about these swim lessons for several weeks. They figured that since I love my baths so much, I'll love swimming. "It's just like a big bath tub," Dad said. Really? I'm going to have to disagree. First of all, my bath tub is nice and quite where as the pool was loud and echoey (not a word? I'm shocked.) In my bath tub, I'm the only one splashing and in the pool, I am not. I'm sure all of you would agree that splashing is VERY different than being splashed. In my bath tub, there's 6 inches of water, in the pool there's 48 inches of water. I know Mom was holding me but I didn't like not being able to touch the bottom. And lastly, my bath water is between 90 and 100 degrees; the pool? NOT! So, swimming lessons weren't real coo [sic] but I'm told by my boyfriend Evan that they get better. I hope he's right! After swimming, M&D ditched me to go see David Sedaris at the Midland. It was cool though because Uncle Dave and Grandpa Davenport are out of town so Aunt Darty and Grandma Davenport had a slumber party and I'm the only one they invited. Sweet! When I got there GmaD was still at work (BOO!) so AD and I did some playing and before too long, I was exhausted. So, AD put me to bed and I didn't even get to see Gmad... until M&D came to get me. When I woke up, GmaD was there and we got to play for a few minutes before Dad made us leave. Boo! It's okay though, on Friday I get to play with Mom, BOTH Gmas and AD at a place called holiday mart. I can't wait... probably. I can't believe how nice it was yesterday. After having to be all bundled up last week, yesterday was an extra special treat. We even got to play outside a little over at Miss Anne's and were out there when Mom came to pick me up. When we got home I was actually pretty tired and tried to take a nap but right after Dad got done with work, they packed me up and we hopped in the car. I was eager to see where we were headed and was pretty excited when we headed toward 103rd and Metcalf. And of course, that's because what's near 103rd and Metcalf is 105th and Metcalf and what's near 105th and Metcalf is CHUCK E CHEESE'S!!! I've wanted to go to Chuck E Cheese's my WHOLE life and I thought yesterday was gonna be the day. (side note, www.chuckecheese.com is the main site but www.chuckecheeses.com redirects you to the employment section. Makes perfect sense?) So I was all hyped for CEC's but M&D took me to Locks and Pulls. Yeah, Locks and Pulls. Where's the fable? I guess M&D want new cabininet [sic] hardware for the kitchen. Come on, you got 70's yellow counter tops and CARPET in the kitchen. New cabininet [sic] hardware is like puttin' lipstick on a pig. After L&P we went to Macaroni Grill for dinner. For awhile I was content sitting in my chair playing with my ducky but eventually I got fussy (due to a wet diaper probably, without the green stripe only I know for sure.) So Dad broke me outta Shawshank and set me up in my seat so I could actually sit up, which everyone knows I love. For some reason Dad set me up facing the wall which was pretty boring so I let him know I wanted to swing around so I could see and be seen. Sitting that was was WAY more fun. Dad even taught me how to make a hand traced Turkey which has me looking past Halloween to THANKSGIVING -- YUM! I was actually pretty facinated fasinated fastenated facenated fascinated (spell checked) with things drawn on the table cloth. I could see them but when I tried to grab them, I couldn't feel anything. Peculiar. Today was pretty nice again and again I got to spend some time outside at MA's. When I got home, I played in my gym for about 90 minutes before I finally needed a diaper changing (probably.) I feel like 90 minutes of playing by myself is pretty solid. Just reiterating how lucky you are M&D. It's been a pretty chill night but I'm ready for bed. After all, I'll need my rest for SWIM LESSONS tomorrow! On Sunday Mom, Dad and I had "breakfast" with Grandma and Grandpa Herbert and Aunt Abby and Uncle Scoot at First Watch. Of course, it was "breakfast" because we weren't supposed to meet them until 12:30 and true to our family's form, we LEFT THE HOUSE at 12:30. Classic Us. Fortunately we went to the FW over on Mission so we had 22 minutes (per Google maps) to come up with an excuse for our tardiness. Not surprisingly, I fell on the sword and took responsibility. I wanted a bottle and needed a bath and M&D tried to squeeze both into an insufficient window of time. Lucky for us and true to their form, AA & US showed up AFTER we did. Poor G&G H could have eaten and left before any of us even got there. After breakfast, we went to Target because it had been nearly 24 hours since Dad and I were there yesterday. The only fun thing we picked up was my Dora the Explorer Splashers Swim Pants -- aka swimming diapers. I start swimming lessons on Wednesday and as much fun as I have in the tub, I'm really looking forward to swimming. I'm super curious how these diapers are supposed to work. I'm guessing the pool people have completely resigned to the fact that babies are gonna pee in the pool and just hope the "swim pants" contain any dirty that may happen. GOOD LUCK WITH THAT! On Sunday night, M&D dropped me over at G&G H's so they could go to an off Broadway show called Spring Awakening. It was actually on Broadway in New York, in fact it won 8 Tonys in 2007 including Best Musical. However, in Kansas City, the Music Hall is a block east of Broadway. I know, I'm awful. I had a lot of fun over and G&G H's though. We playd some paddy cake and GpaH played the piano while GmaH and I did some singing. I love the piano! M&D didn't take any pictures on Sunday - FAIL - so here's a picture preview of tomorrow's post. And yes, that means I'm going to bed now. On Friday, I went over to Grandma Herbert's in the morning. We had a lot of catching up to do because I haven't gotten to spend much time with her since she got back from from California. It sounds like she had a lot of fun playing with Uncle Charlie, Aunt Eva and Cousin Jamie in Palo Alto and then she got to play with the Bakers down in LA. I'm totally Jealous! It's when I'm at GmaH's that I really dislike this cold weather. When it's nice, GmaH and I were good for a walk or two every time I was over there but with this weather, it's too cold for me to just be outside leisurely. Boo! In the afternoon, Grandpa Herbert got home from work. YEA! GmaH had set up this sweet little area for me to sit and play on and GpaH took the opportunity to come down and play too. I'm a pretty good sitter but it's probably a good idea to have some buffers in case I lose my balance. I've taken enough headers to know that I don't want to take headers... unless I'm surrounded by some cushy pillows. Although some times they look comfy and I just take a header on purpose... then a nap. On Friday night, Aunt Abby and GmaH worked on my Halloween costume. I can't tell you what it is though because it's a secret. I'll be honest, it's totally cute. Mom actually took me to get my picture taken in it this morning. After my photo shoot, Mom, GmaH and AA and I met Dad for lunch at Nordstrom Cafe. That place needs a special stroller parking lot because you can't even walk around in there without tripping over an oversized stroller. After lunch, Dad and I went over to Target to do some shopping. I took a little nap but not until after we left the baby section. Sweet! I got some new diapers (SIZE 3) which M&D seem to think is pretty significant. Of course, it's only because the green stripe that makes it so easy to tell if I need a new diaper only goes up to size 2. W, I'm not too worried about it. Dad decided to go with Cruisers because they're supposed to be more comfy for active babies. I guess that means I need to start crawling. Good luck with that M&D! The rest of the day has been pretty chill. My teeth are killing me now though so I think I'm gonna try to sleep it off. It's been several days since I've done a post which means I have way too much to blog about. So, I've decided just to post a few pictures. On Monday morning, Dad was running around trying to get my bag ready for Miss Anne's so I decided to sit down with a book. I know how this one ends but it's my favorite book... to chew one. Sometimes when Dad thinks I'm looking particularly cute in the morning, he takes my picture before he takes me to MA's. This is the first time I've worn this totally cute outfit so he insisted on taking a pic. And he was right to insist because I did NOT come home in the same outfit because... well, you can probably guess why. Two of my favorite toys right now are my stackable rings. As I was playing with them the other day, I thought I saw a familiar pattern used by the federal gov't. 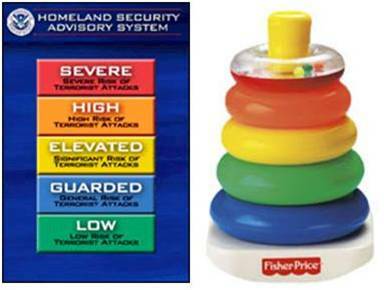 However, where Fisher-Price stayed true to the color wheel, the Department of Homeland Security decided to buck the system. I assume they wanted to follow classic stop light order with Red on the top, Yellow in the middle and Green on the bottom. I like FP's version better. Oh, and by the way, the current threat level is Yellow - Significant Risk of Terrorist Attacks. Yikes! Also, the Orange Ring is highly delicious! This is just a pic of Dad and I playing Wednesday post bath. Dad keeps it a little chilly in the house though so Mom had me wear this cute little hat. It's only October and I can already tell that Mom is gonna be a crazy person when it comes to protecting me from the cold weather. If I have to bundle up like this IN the house, what am I gonna have to wear when we go out in December??? What I really need is my size snuggy (or slanket) -- GO! She really should be embarrassed too because while my jammies and hat are both polka dotted, they do NOT match. Seriously, fashion is foremost and comfort second. Duh, every girl knows that! I mean, just take a look women's shoes; the evidence is all right there. As I was playing with my rings this afternoon, I managed to get one on my leg. That's apparently picture worthy. I used it as an excuse to put my other foot in my mouth. Mom, Dad and I had dinner with Aunt Darty and Grandma & Grandpa Davenport tonight at Houlihans. Shortly after we got there, I started whining so GmaD would hold me. I have her totally wrapped around my littlest of fingers. And she totally indulges me too; she fell for the, "Hey What's That -- Made ya look!" She's so silly! Oh, Happy Anniversary to Mom & Dad. I guess they've been married for like four years or something. Here I just assumed it was a shot gun wedding because of me - who knew? Saint Louis Fashion Week began yesterday. You'll notice I didn't add a link though because I am officially boycotting the event. If you recall from one of my last posts in August, Aunt Abby was trying to get into Saint Louis Fashion Week via a contest where people voted for their favorite designers. I know I personally voted for AA many times and urged my readers to do so as well. The six designers with the most votes were supposed to be the ones that showed at SLFW. Well, apparently nepotism and scandalism (additional reference) are rampant inside SLFW because after weeks and weeks of voting, they threw out the results and just chose the six they wanted. This included at least two designers that had previously shown, one of which was actually an apprentace apprentice to the contest director. Now, I'm not a doctor but that sounds a bit fishy. Wait, I'm not a fisherman but that sounds... er, wait, something about malpractice? I don't know. Any way, here's a picture of AA and me when we found out the she wouldn't get to show. I spit (up) in their general direction!! Whoa, I had a crazy busy weekend so try to keep up. Mom didn't have work on Friday so I was looking forward to playing with her a bunch. We woke up and headed out nice and early... to Grandma Herbert's where she dropped me off. Where's the fable?? It was her day off but because she had a dentist appt, she had to ditch me. Not cool Mom! It's okay though because GmaH had been out of town for awhile and we had a lot of catching up to do. I feel like I've been missing someone else too but for the life of me I can't remember who. Did someone go with GmaH to Cali? Hmm, I've got nothin'. Anyway, it was a lot of fun to catch up with GmaH but our time was cut short because Mom came to pick me up so we could run some more errands. First stop was to Sam's Club where we met up with Aunt Darty and Grandpa Davenport to do some shopping for a party later that night. Then we ran to a liquor store where they bought a bunch of bottles, not one of which was for me. Where's the fable? Next stop was to Chipotle to get some lunch for Dad. I begged Mom to throw it in the magic bullet so I could have it via a bottle (or 9) but she was having none of it. Doh! I have a LOT more to go through from this weekend but I'm exhausted so I'll have to spread it out over a few nights. "LA's fine, the sun shines most of the time and the feeling is laid back. Palm trees grow and rents are(n't) low but you know I keep thinkin' about makin my way back. LA's fine but it ain't home" -- SO COME HOME GRANDMA HERBERT! I know I'm way behind on my posts so I'm gonna try to bust the last few days out; just hitting the highlights. I felt like Monday was a pretty average day but I must have worked up quite an appetite because for dinner, I had a bottle followed by a serving of squash which I wolfed down in a record number of bites but I was STILL hungry. Mom suggested that Dad not give me any more veggies because maybe I didn't need more fiber so Dad went with oatmeal instead. That's right, I had a full bottle, a serving of veggies AND a serving+ of oatmeal. I am my father's daughter! While Dad was getting ready Tuesday morning, he had me on M&D's bed with my sisters. He decided that since I was sitting up so well, he'd go ahead and break out my Kushies Baby Zolo Boa Stacking Rings. Great's Uncle Dale and Aunt Suzi got me this ages ago but it's a 6+ month toy so it's been put away until now. The rings are soft and have fun edges that I LOVE to play with and as a bonus, they each make a sound when you squeeze the right spot. From bottom to top, the rings say Chirp, Moo, Oink, Ribbit and HeHeHe. What's funny is that the packaging lists out these sounds in three languages, English, French and a third I don't know. Apparently French for Ribbit is Krouik-Krouik. Crazy Frenchies! What's crazier is that after Mom and I got home, we played up in my room and she broke out the classic version of stackable rings without even knowing that I'd played with the Boa in morning. Whoa great minds! As for today, I've just been exhausted. I napped for about four hours over at Miss Anne's, then again for about three hours after I got home. Who knows how long I would have slept if Mom didn't come wake me up for dinner. Mom tried to start dinner with oatmeal but I wasn't in the mood; I wanted my bottle! And it was delicious. After dinner I played with Mom until she went to bed (quitter) then I played by myself for bit longer. I LOVE being able to sit up. It makes playing so much more fun! Uh oh, Dad just caught me in a yawn so I know he's gonna make me go to bed now. On Friday, Mom had to work and Grandma Herbert is in California so Grandma Davenport played hooky to babysit me. YEA! To make the drop off, Dad and I were supposed to meet G&G D at First Watch for breakfast. Unfortunately, the drop was scheduled for the crack of dawn which does not meld well with our regular morning lifestyle. To start with, Dad had to wake ME up rather than vice a versa. To his credit, he didn't seem vengeful or anything though which seems like a pretty good quality for a Dad. Believe it or not (I couldn't) we were only five minutes late to breakfast. How sad is it that I'm claiming success because we failed by a small margin rather than failing by a large margin. Lovely. I had a lot of fun with G&G D at breakfast but my battery is about to die so I'll have to finish telling you about the rest of my weekend another time. I know everyone loves my toes (especially Great Grandma Davenport) so I've been spending a lot of time lately checking them out for myself. I mean, I like 'em because I can put 'em in my mouth but that doesn't explain why anyone else likes 'em. Hmmm... I'll keep checking and let you know if I come to any conclusions! I went to bed around the normal time but my subconscious (whoa, spelled right the first time?!?!) must have realized I hadn't blogged because I woke up at 11:30pm which is certainly NOT normal. Or maybe I was dreaming about blogging and that triggered something. Or maybe like this article suggests, I was practicing sitting up or rolling over IN MY SLEEP and that's what woke me up. Of course, I don't remember anything so this one will have to go unsolved. Anyway, as luck would have it, Mom and Dad were still up. YEA! Mom was working (boo!) so Dad and I did some playing. A little after 1:00, I let one little yawn slip out and that was all the encouragement Dad needed to send me back to bed. DOH! Today is actually my six month birthday -- HOLY COW! Where has the time gone? I hope I don't suffer from a mid-life mid-year crisis or anything. Although, if I did I suppose I could go out and treat myself to something fun. I think I'd like to have something big -- you know, for safety and all -- so maybe something like an Escalade would be nice. "Cadilac-ac-ac-ac-ac-ac! You oughtta know by now" that I'd go with the pink Barbie version. Sweet. Mary-Kay's got nothin' on this pink Caddy! Since it's my birthday, it means picture time on Mom's giant calendar. I'm cool with it though because I know after my solo shoot my sisters get to come in and play with me. Here are a few from this session; click to enlarge.